This is genuine YHB Glass Crystal, which is manufactured in China. The size is SS 10 (~3.2mm) and comes with original factory packing of 1,440 pcs per pack. The color is Crystal. YHB crystals are bright and sparkle and claim to be the best economy hotfix crystals. Silver foiling backing the crystal makes them even brighter and sparkling. The YHB Hotfix are machine cut (MC) rhinestones and contains 10-16 facets, has a grey glue and gives a brilliant appearance. The quality is almost as good as Czech rhinestone but with only at a fraction of the price. 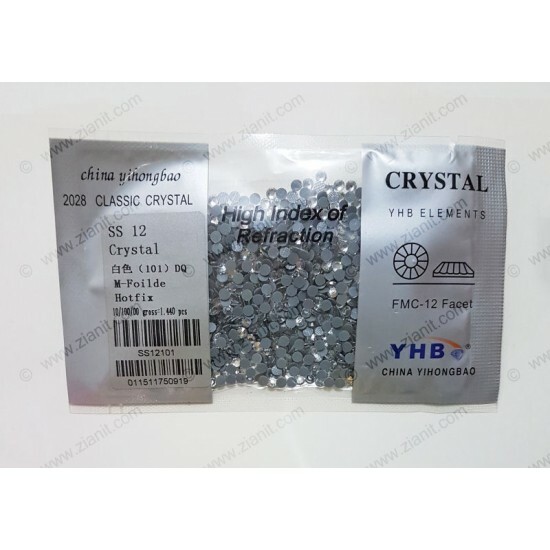 If you are looking for Swarovski Copy hotfix, DMC hotfix, AAA Grade Hotfix then, YHB hotfix crystals can match or even exceed them in terms of quality, brilliant and sparkling. This is genuine YHB Glass Crystal, which is manufactured in China. The size is SS 12 (~3.2mm) and comes with original factory packing of 1,440 pcs per.. This is genuine YHB Glass Crystal, which is manufactured in China. The size is SS 16 (~4mm) and comes with original factory packing of 1,440 pcs per p.. This is genuine Swarovski Crystal, which is manufactured in Austria. The size is SS 20 (~5mm) and the colour is Fuchsia (502). Swarovski crystals a.. This is genuine YHB Ceramic Hotfix, which is manufactured in China. The size is SS 10 (~3mm) and comes with original factory packing of 1,440 pcs per .. This is genuine YHB Ceramic Hotfix, which is manufactured in China. The size is SS 20 (~5mm) and comes with original factory packing of 1,440 pcs per ..